The Robe Shop: your source for choir robes, choir cassocks, Children's choir robes, choral gowns, custom choir robes, choir gowns for rent, church choir gowns, choir stole, Rental Choir Robes, kids' choir gowns, surplice, choir collar, choral cassocks, robes for kids choir, rental robes, woman owned small business. 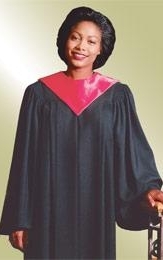 Order choir robe catalog, robes for choir, gospel choir robes. Made in USA by Murphy Robes, Herff Jones. Get what you need now, it's easy to add additional robes later! No waiting for custom robes to be made- Ready to ship! The Robe Shop has been providing robes all over the U.S., Canada & the world since 1979. Interested in Murphy Robes, Collegiate Apparel or E.R. Moore? We are the retail dealer...contact us for your choir robes by these manufacturers and benefit from our special coupon offers. All Qwick-ship garments are sold EXACTLY AS SHOWN, providing custom quality at a lesser cost. For any variation of fabric, color, etc, you will need to order on a custom basis. Qwick-ship garment price is noted in 2 categories: discounted price for orders of 6 or more identical garments (6+), or standard price for orders of less than 6. Qwick-ship garments are made according to specific sizes, unique to our products. Please see our size charts on the ORDER FORM web page. Qwick-ship choir robe styles are for purchase only- rental robes are totally different inventory (see link above). Continue below... photos show adults, but we have kids' sizing!! The Qwick-Ship Crescendo C-33 choir robe is already made with open sleeves, cream and maroon Wonder Crepe fabric, and including a latin cross monogram on the 2 front banners. The Qwick-Ship Epiphany C-35 choir robe is already made with vermillion and black VIVA, white piping accent and including a dove monogram on the yoke. Overlay C-36 has a Latin Cross monogram on the center. The Overlay C-36 can be added to a robe or a black turtleneck and pants for a low-cost choir look. The Qwick-Ship Festival C-37 choir robe is already made with sapphire (vivid blue) VIVA, gold contessa yoke, sleeve accent and front banners, including white-gold metallic ribbon trim. The Qwick-Ship FestivalC-39 choir robe is already made with chianti (raspberry) VIVA, gold contessa yoke, sleeve accent and front banners, including white-gold metallic ribbon trim. 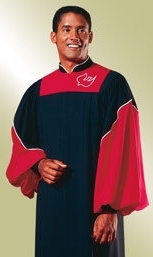 The Qwick-Ship Harmony C-32 choir robe is available two ways. It is already made with purple VIVA, linen (off-white) yoke and front banner, including a treble clef & dove monogram on the yoke. If you can wait 2 weeks, you can also have up to 3 initials embroidered on the front banner. The Qwick-Ship Galaxy C-42 choir robe is already made with purple and black VIVA fabric, purple-gold ribbon trim, cuffs and Fared Cross monogram. The Qwick-Ship Choral Cassock C-43F (female) choir cassock is already made in chianti VIVA fabric, suitable for wearing under a surplice. Sorry, no men's sizing. We also supply a full range of fully tailored rental gowns (in adult sizes only) in an acetate or polyester fabric, through our Grad Goods & More division. These are traditional all-one-color robes- choose from these colors: Black, Red, White, Gold, Royal Blue, Holly Green, Grey, Maroon, Navy Blue, Purple, Brown, Wedgewood (grey-blue), Antique Ivory (creamy, slightly yellow). For rental robe sizes, please see measuring or order form. Please note that Qwick-Ship robe sizing or styles does not apply to RENTAL robes! Need stoles? 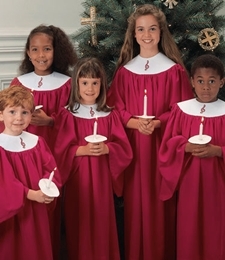 We do not provide rental Choir STOLES, but see below for low-cost Ready-to-Wear Choir stoles. Complements our plain Tempo, Anthem or Children's Sonnet Robe! Choose PLAIN or with a CROSS MONOGRAM. Item #GGSTOLE $14.50 Front Hanging Choir Stoles are made from quality satin for the graduation market in a myriad of colors, 4 inches wide and 29" from the center neck seam. For immediate shipping, we stock plain stoles in the satin colors gold, red, white and royal blue. Please note that non-stocked satin color orders less than 5 dozen are assessed a set-up fee of $25. Please allow at least a month for custom colors including antique gold, maroon, powder blue, azure blue, purple, teal, silver, lilac, columbia blue, peacock, scarlet, emerald green, hunter green, dusty rose and many more. Yes we can supply large group orders! The Qwick-Ship Overlay C-36 (Shown over robe, overlay does not have sleeves or collar) is already made with vermillion and black VIVA, white piping accent and including a Latin Cross monogram on the center. The Overlay C-36 can be added to a robe or a black turtleneck and pants or skirt for a low-cost choir look. Item #GN11608 $34.35 6-Robe Deluxe Nylon Robe Bag (6 bags or more: $30.90) Ideal for storing multiple robes. Our heavy duty contoured Robe Hanger is designed to preserve the yoke shape between wearings. Over time, a wire hanger can rust and cause crease lines on the shoulder of your choir robe.